Visit the Downtown Disney District, a lively promenade featuring unique shopping and dining, as well as exciting nighttime entertainment. Located just outside the Parks and adjacent to the Hotels of the Disneyland Resort, the Downtown Disney District offers something for everyone from early morning until late at night. Get away for a few hours and spend some quality time in an immersive Disney environment, all without an admission fee. 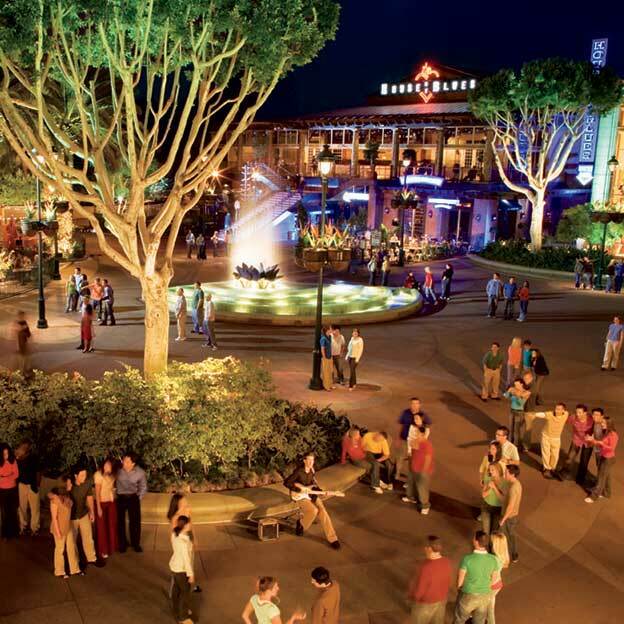 The Downtown Disney District features open-air cafes, lively entertainment, nightclubs and a movie theater. You’ll feel transported to a uniquely Disney world where you can relax and spend some special time with the people you love. And if you live in Southern California, it’s all right next door! Arrive via foot, monorail or automobile. The Downtown Disney District parking lot is conveniently located next to the action and offers free parking for up to 3 hours — or up to 5 hours of free parking with validation from participating locations. Dynamic live performers kick up the energy and give the Downtown Disney District a party-like atmosphere. A talented cast of professional musicians specialize in diverse musical styles, ranging from classical, to Latin, to acoustic guitar, to rhythm and blues. Acts and times vary. RIDEMAKERZ is a supercharged, interactive experience where kids ages 6 to 106 build and customize their very own radio-control cars and trucks. There are more than 649 million ways to make your ride one-of-a-kind! Where do you find stylish clothing, jewelry and merchandise fusing urban art and Disney’s creative flair? D Street! Discover chic apparel, pop culture novelties, vinyl figures and collectibles, along with Disney-inspired art from popular artists. Take your place in front of the stage where legends are made! You won’t be able to stop dancing. See world-famous performers, live and in person, as well as the best up-and-coming talent from around the region. Watch the newest hit movies in stunning theaters featuring first-class luxury and amenities. Sample the spiciness of Cajun cuisine with gumbo, Gulf seafood, po’ boy sandwiches and decadent desserts. As part of a total entertainment and dining experience, the music never stops and Bourbon Street’s legendary party atmosphere pulsates to life. Filled with the hottest new lines for babies, toddlers and tweens, kitson kids has the latest in hats, beanies and hair accessories. Choose from the coolest swimwear, shirts, skirts, pants and dresses. This celeb-kiddy fashion forum is all the rage for high-profile moms. Ever wish you could rock out like some of your favorite TV stars or pose for your very own photo shoot? Now you can! At Studio Disney 365, you can undergo a complete transformation to get camera-ready for a grand entrance onto the set. Get ready — you’re wanted on the set! NEW! TODAY Cafe Coming to Universal Studios Florida Inspired by the TODAY SHOW!